Normally I don't write blogposts on a monday, but this product really is worth sharing! 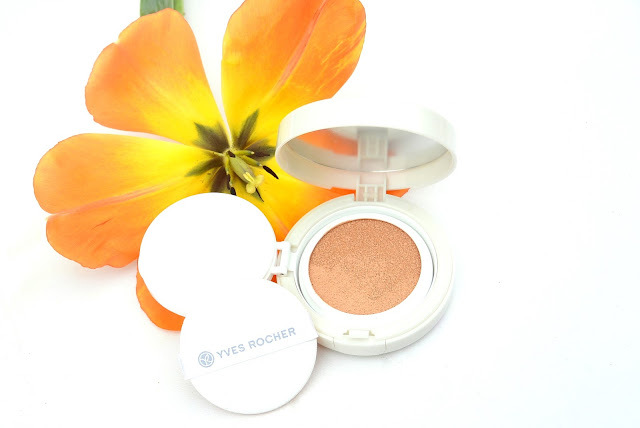 I tried out the cushion foundation by Yves Rocher called Pure Light. 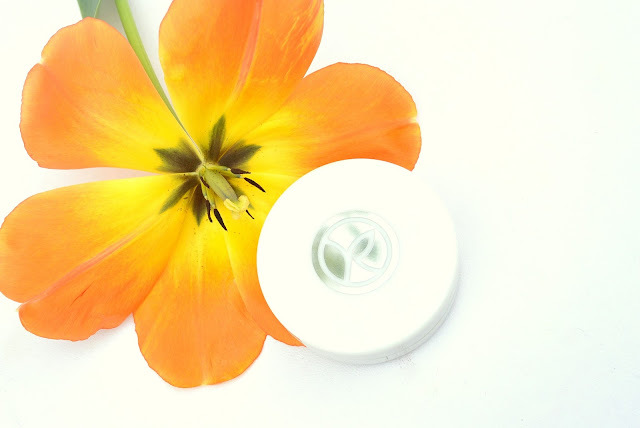 Are you looking for a fresh, luminous and healthy looking complexion? Then this blogpost is an absolute 'must read' for you. First of all, Pure Light is a line in the Yves Rocher stores that includes different products. For example, they also have a pure light fluid foundation and a pure light powder. First, let's take a look at the packaging from this product. The cushion foundation by Yves Rocher comes in a very simple packaging. The name 'Pure light' is written in a silver square, so it immediately catches your eye. For me, this is a very 'Yves Rocher-like' packaging. Simple, clear and easy to read what you want to know about the product. When opêning the packaging, there comes out a white round box. On this box you can notice the 'R' by Rocher (Yves). Yet again, it is simple but it doesn't need to be more for me. Immediatelly in one single step, your complexion can be illuminated and your facial features will be smoothed. The fresh texture of this cushion foundation enhances your complexion in only seconds. When you're using the puff applicator that comes with this product, lightly press on the foundation cushion. Then, gently puff it on your face. When you want more coverage, you should take more texture. But be carefull that you don't 'overdo' it. I got myself the lightest color they have: Rosé 200. As you can see on my arm it looks a little bit too dark, but it is perfect for my face skintone. This pure light cushion foundation doens't give a high coverage, but a natural one. 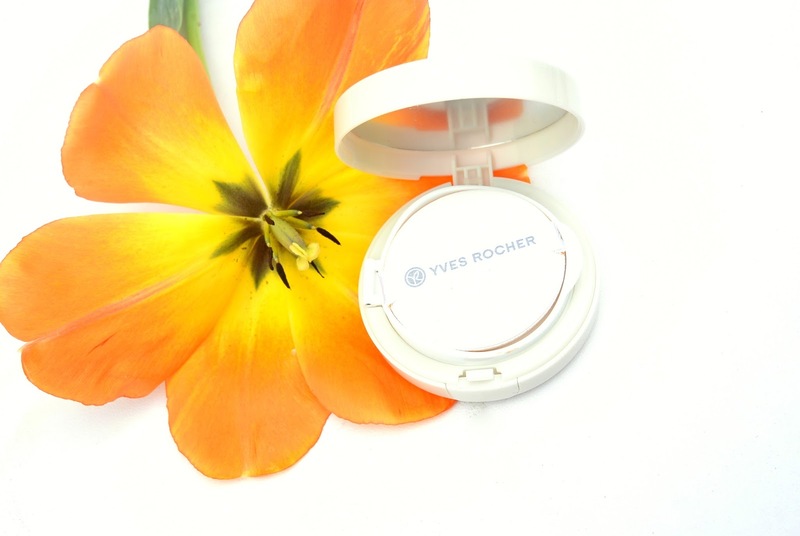 This pure light cushion foundation by Yves Rocher combines the convenience of a compact foundation with the lightness of a fluid foundation. I like using cushion foundations like this one to do a quick touch up during the day. They are so easy to carry with you and youn always have the product, applicator and a mirror with you. Do you like using cushion foundations? Ik heb deze ook gehad en voor mij was hij veel te donker. De cushionfoundation van L'Oréal is mijn favoriet, die is iets lichter! I've never tried one before! This one looks waaay too dark for me sadly. Ik vind cushion foundations ook echt fijn, Lancôme is nog steeds mijn favoriet!